Cashless Health Insurance Policy provides cashless hospitalization service to the policyholder. You need not arrange cash for the bill payment if you are holding cashless health insurance policy. All the medical bills are directly settled by the insurance company, provided claim amount is within sum assured limit. Let me ask a simple question – What is the first thing you do in case of medical emergency or hospitalization? Well, in most of the cases people rush to the nearest ATM for the withdrawal of money. A delay in arranging cash leads to a delay in the starting a treatment. In order to avoid this type of situation, it is advisable to opt for a cashless health insurance policy. In this post, we will take a look at 5 Best Cashless Health Insurance Policy in India. Apart from that, we will also talk about types of cashless health insurance policy and points to consider before buying cashless health insurance policy. There are three types of cashless health insurance available in India. 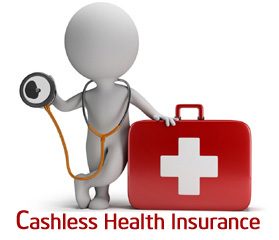 Cashless family health insurance is a policy that provides complete coverage to family up to sum assured. One can avail cashless claim service for any family members. Cashless family health insurance is policy that provides complete coverage to family up to sum assured. One can avail cashless claim service for any family members. Cashless health insurance for a senior citizen is an exclusive policy for the senior citizen. You can purchase this policy for your parents and grandparents. This policy may or may not cover pre-existing diseases. You need to check policy terms before purchasing. Apollo Munich Optima Restore Health Insurance is the first best cashless health insurance policy. The features offered by Apollo Munich Optima Restore are given below. Offers a wide range of coverage. It offers both individual and family floater policies. This policy offers restore and multiplier benefit. Organ Donor and domiciliary treatment covered. E-opinion for critical illness available. Alternative treatment like Ayurveda is covered. Wide network coverage for cashless claims. ICICI Lombard Health Care Plus is a second-best cashless health insurance policy that provides a wide range of network hospital coverage. The features offered by ICICI Lombard Health Care Plus are given below. Cashless approval within 4 hours. Add-on coverage for outpatient treatment, wellness and maternity benefits. Fast and efficient claim settlement process. Lifetime renewal option for policy. No sub-limits applicable on room rent, hospitalization and doctor’s fee or diagnostic tests. Religare Health Care is another cashless health policy that provides comprehensive coverage to the policyholders. The features of this policy are given below. Cashless treatment at 4600+ hospitals & daily allowance. Auto recharge of policy sum insured if it has exhausted. Pre and post hospitalization coverage. Alternative treatment Ayurveda, Unani, Sidha or Homeopathy are covered. Max Bupa health insurance policy is another best health insurance policy that provides the cashless facility. The key features of this policy are given below. Free Health check-up for every second year. No sub-limits on room rent. Increased sum insured on every claim free year. A Cashless facility at the nearest hospital. Bajaj Allianz is excellent health insurance company that offers both individual and family floater health insurance. Bajaj Allianz Health Insurance provides highest network coverage where you can claim cashless claims. Cashless claims facility at 6000+ hospital network. Family discount up to 10%. Coverage of family member up to 6. 10% co-payment for non-network hospitals. No sub-limit on room rent. The cashless mediclaim is offered on health insurance policy eliminates the needs of running around for arranging fund at the time of medical emergency. The cashless claim facility is available only at network hospitals. Hospitalization bills, up to the sum insured are directly settled by the insurance company. There are two types of cashless claim services. A planned claim is a claim where the policyholder is aware of hospitalization two-three days in advance. In this case, the policyholder takes approval from the insurance company a few days before. Following steps needs to be followed for a planned claim. Once you have finalized the hospital, take your policy card and ask for preauthorization form. Fill up the form and take authorization from attending physician. Submit the form to TPA via hospital desk. The form will be scrutinized and approval letter mentioning sanction amount and treatment detail will be sent to the policyholder. When policyholder or family member insured under policy required emergency treatment due to accident or any other crisis situation emergency claim process is followed. The process is given below. Show your health insurance card issued by the insurance company to hospital. The card contains a policy number and validity. Fill up and submit the pre-authorization form available at hospital desk. The form will be sent to TPA via hospital desk. TPA needs to approve the form for cashless treatment. As per protocol TPA should process form within 6 hours. Cashless claims facility is available only at network hospitals. Check list of networking hospitals. Check how smooth is process of filing and settling claim by insurance company. Find out TPA approval time for pre-authorization form. It should be low. Remember to keep all photocopies of documents including medical bills, claim form and discharge papers. Insurer will pay amount up to sum assured. If you exceed sum assured amount you need to pay additional amount. I hope the information given above will help you in the selection of Best Cashless Health Insurance Policy. If you have further queries for the selection of health insurance post it in the comment section.